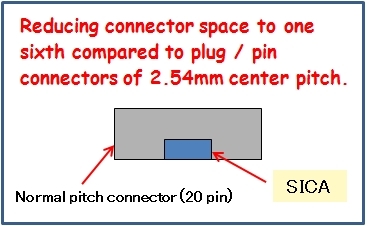 Reducing connector space to one sixth compared to plug / pin connectors of 2.54mm center pitch. (1)Place the SICA target connector(SICA2P20S) on the target board. (2)Connect the normal pitch connector cable to the SICA 2.54mm pitch connector PWB type. 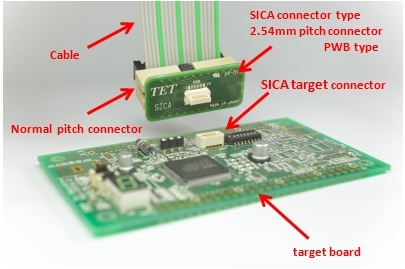 (3)Connect the SICA 2.54mm pitch connector PWB type to the SICA target connector on the target board. The target board connector surface mounted on PCB without needing any "through holes". Now, the other side of PCB is available for mounting components. Connector contact life is 500 times of insertion and extraction. 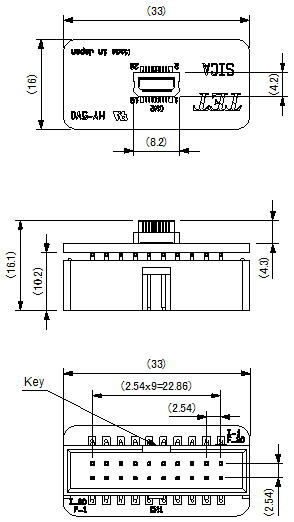 A polarity key prevents the user to plug the connectors in the wrong direction. This product is in compliance with RohS. ✽The information in this document is subject to change without notice.